When the two surfaces of the hip joint move over each other, they usually move freely without any friction. If there is an alteration to either the socket part of the joint (the acetabulum) or the ball (the head of the femur), irritation may occur as the two surfaces move over each other. This is known as Femoroacetabular impingement, a common disorder of the hip, characterized by pain and stiffness. 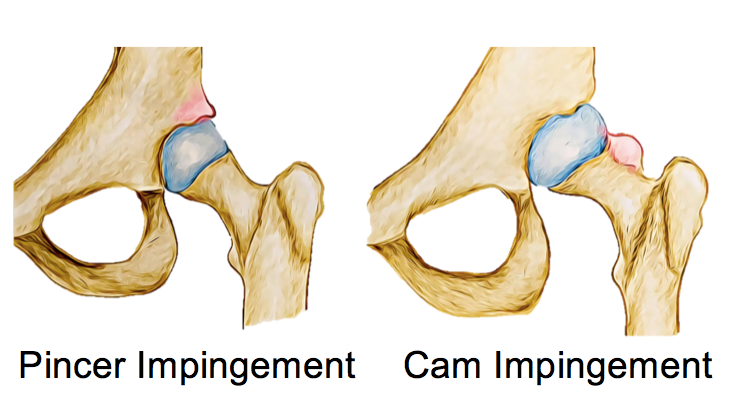 Femoroacetabular impingement can be classified as cam, pincer or mixed. A cam FAI occurs when the femoral head junction is flattened or a small bump is present. Pincer type of impingement occurs when the acetabular rim extends slightly, causing the femur to be impacted. Cam impingement is more common in men while pincer impingement is more common in women. However, most cases of FAI (about 85%) are mixed, meaning they both have cam and pincer types of impingement. The most common symptom of FAI is pain located in the hip or groin when resting in certain positions of with specific movements. Some patients also report pain in the back, buttock or thigh. Other symptoms include stiffness, loss of movement range (particularly of the hip), locking, clicking or a feeling that the hip is about to give way. Activities that cause the incongruous surfaces to move over each other repeatedly are naturally the main culprits for causing symptoms. These can include prolonged sitting, twisting, sitting with crossed legs, squatting and climbing stairs can all aggravate the pain caused by femoroacetabular impingement. Small bony growths around the joint called osteophytes. Femoroacetabular impingement is a complex condition and researchers are still determining the best possible treatment. It is thought that untreated FAI can lead to osteoarthritis of the hip down the track and there are both surgical and non-surgical options for treatment. Conservative (non- surgical) management for FAI involves core stability training, strengthening exercises for the lower limb specifically the hip and postural balance exercises. This program aims to improve the hip’s neuromuscular function. A hydrotherapy program can also helpful as it reduces weight through the joint, making movements more comfortable. Lastly, a home exercise program is made for patients, so they can continue treatment at home. For many people, physiotherapy is enough to resolve their symptoms and prevent future problems, however other may require surgery.